As a reader of Apprising Ministries you’d be familiar with the sinful ecumenicism of major figures associated with the SBC such as Billy Graham,2 the late Chuck Colson, quasi-elder Beth Moore and Warren himself.3 They are hardly alone; and nothing has been done by the SBC about their regularly referring to the apostate Church of Rome as a Christian organization.4 So, like me, you’re probably wondering what it is many in the SBC are actually protesting in regard to the Roman Catholic Church; could it be as simple that the RCC isn’t giving to its prized Cooperative Program? You may recall I’ve shown you, e.g. in Rick Warren And Teachings Of Demons, that for years now Warren’s really been leading this charge within evangelicalism for full Christian fellowship to be restored completely to the RCC. Like it, or not, in addition to being a highly influential pastor within the SBC—Rick Warren truly is a leading spokesman before the world for the mainstream evangelical section of the visible Christian church as well. With this in mind then, I’m going to remind you that the video clip following below is actually Part Two of an interview with the sinfully ecumenical Warren, which was done by Raymond Arroyo, host of The World Over program of the Roman Catholic Eternal World Television Network (EWTN). It originally aired on on EWTN April 13th and 14th of this year. Raymond Arroyo voice over: Why is the vatican visiting this evangelical church? Founder and pastor of Saddleback, Rick Warren, joins for Part Two of our exclusive interview. Arroyo: The World Over live, begins, right now. Female announcer voice over: Now, once again, Raymond Arroyo. Arroyo: Welcome to The World Over live. Following the death of his son, Rick Warren has focused part of his ministry on mental health, leading to a collaboration with the Catholic Dioceses of Orange County as we reported last week. In the second part of our exclusive interview, Warren discusses the origins of his best-selling book, The Purpose Driven Life, a recent visit by a Vatican delegation, and the channel he finds himself watching more than any other. Here’s my conversation with Rick Warren. Arroyo: What is the key to that success? Why were so many people touched by that book and continue to be? Warren: You know, Ray—there’s not a single new thought in Purpose Driven Life that hadn’t been said for 2,000 (Arroyo laughs) years. I just said it in a fresh way. I said it in a simple way. When I was writing Purpose Driven Life, it took me seven months, 12 hours a day. I’d get up at 4:30 in the morning, I’d go to a little study; start at 5am, I was fasting till noon; and I would light some candles, and I would start writing and re-write, re-write, re-write and re-write. And one of the things I did before I wrote the book was um—I asked the question, “How do you write a book that lasts 500 years”? Warren: Uh, Practicing the Presence of God by Brother Lawrence. Warren: Okay, The Desert Fathers, St. John of the Cross, Teresa of Avila—all of these great, classic devotional works; and one of them—I just realized that in order to be timeless you have to be eternal. Arroyo: A lot of preachers would like to know. Warren: (Laughs). Well, Jesus said, “I’ll make you fishers of men,” and I liked this fishing motif. Um, and I think the first thing is you have to go where the fish are. Okay, they’re not in church, you gotta go into the marketplace. Uh, you gotta learn to think like a fish. (Arroyo laughs) Uh, you got to know what they like to eat. You gotta drop the—the bait at right—the right level. Ah, you—you use all kinds of—Paul says, “I become all things to all men that—I’m in some ways might save some.” So, he says, “When I’m with Jews, I become like a Jew, to reach Jews. When I’m with Gentiles, I become like [a] Gentile, to reach Gentiles.” Today he’d say, when I’m in California, I become a Californian, to reach Californians. Arroyo: I should have left the tie at home; is that what you’re saying, Rick? Warren: (Laughs) Yeah, right. Well—and the main thing is love always reaches people. It—authenticity, humility—Pope Francis is the perfect example of this. He is, uh, he is doing everything right. You see, people will listen to what we say, if they like what they see. Arroyo: (Laughs) That was a headline? Warren: That was a headline! It was the headline. I saved it; I showed it to a group of priests that I was speaking to a while back. Arroyo: I love that! I wanna take you back a little bit before we talk about your ministry. Arroyo: Reflected in your life now, and in your work, now. Warren: Well, my parents were very general, gentle, humble, poor people, they—they did not have a whole lot of money. Uh, we were in rural churches—my dad never pastored a church of more than about 150 people. They were very, very generous people, loving people, and they really taught me—my dad taught me how to get along with either—ah, a—ah—ah—ah—a drunk on the side of the street or a king. He—he could be as comfortable with a pauper or with a politician. Arroyo: And your mother taught you a love of things written. Warren: She did. My mother was a librarian and, prior to that, she was a bookstore manager at a seminary. And so, as a bookstore manager, she would get a free copy of each of the books—my dad had a pretty good sized library. And when I was ordained my dad gave me—I think, um, three or four thousand volumes himself. I began collecting books at 14. I use to read a book a day. I read a book a day for many years. Today, I probably have 35,000 volumes in my library. Arroyo: She talks about both you, and she—after now 40 years of marriage—just about, right? Arroyo: Uh, that when you first met, you all were not really attracted to each other. Arroyo: You felt that it was a sort of, a divine call? Warren: Oh yeah, it was. In fact, um, I’ll never forget—I was actually speaking in her father’s church. She was playing the piano, my best friend was leading , ah, worship music. And I remember sitting there on stage getting ready to speak and I looked over her and clearly, a—a voice in my mind—I mean it wasn’t audible—but it could have been audible; it was as clear— an’ said, “You’re gonna marry that girl.” Now, I immediately doubted that for three reasons. Number one, God has never spoken to me that clearly before or since—ever. Okay; it was that clear. Second, I wasn’t in love with her; and third, she was in love with my best friend. So after God said that to me, I—I just filed that away and made no attempt to—to even date her. And, ah, we’re going to the same Christian college—when school started again in the fall, um, I had a prayer partner, who—every morning at 5am we would get up and go out to the baseball dugout and we would pray from 5-6am every day—and we never missed a day for a year. Warren: One day, several months into that—in the middle of a prayer—Danny stops and he says, “Rick, you’re gonna think this is strange, but, I have this sensation that you’re gonna marry Kay Lewis.” And I said, “Well, don’t worry about that, God told me that five months ago,” and we jus—just keep on praying. Warren: We ended up together, and we’re—we’re now 38 years in marriage—my wife is my best friend. I’m hopelessly in love with her. Arroyo: Not only for that year—but for 25 years. Warren: When Kay and I got married 38 years, we started tithing—giving 10% of our income, ah, to the Lord, and to the Lord’s work. Warren: I’ve lost it every year. Warren: And uh, and, uh, th—there’s really—it, eh, a great joy in generosity. Warren: Ray that was a turning point in my life. I said, “I’ll give the rest of my life for people like that.” And I’ve spent most of the last decade in little villages around the world you’ve never heard of helping these barefoot evangelists, these priests, these pastors, these deacons, these ministers, these Bishops, who are serving faithfully; when I have so much and they have so little. And out of that we developed the PEACE Plan—P-E-A-C-E and it is based on Jesus saying, “When you go in a village, find the man of peace.” And PEACE stands for Plant churches, Equip leaders, Assist the poor, Care for the sick, Educate the next generation. Now today, I’ve sent 23,869 of my own members overseas to 196 nations; so we’ve done the PEACE Plan in all 196 nations. Warren: If you love Jesus, we’re on the same team. Warren: Every one of them. Arroyo: What is keeping these communities apart? And what do you think is bringing them together? Warren: And he—here’s the thing—people don’t realize how big the church really is. It’s the largest organization on planet earth. We don’t have anything to apologize for; there’s 600 million Buddhists in the world. There are 800 million Hindus in the world. There are about 1.5 billion Muslims; but there’re 2.3 billion Christians who would say, “I believe Jesus is who He claimed to be—the Son of God.” That means 1 out of every 3 people on this planet. The church is bigger than China. Warren: The church is bigger than China and India put together. Nothing is big—and we have more outlets—I could take you to 10 million villages around the wh—world the only thing in it is a church. That’s why there is no global problem, poverty, disease, illiteracy, or whatever, that can be solved without the church. Arroyo: Vis–à–vis this Hobby Lobby case. Arroyo: You know David Green. Arroyo: Created this situation; this right to worship because, for so long, they kept their values confined to the four walls of their churches. Warren: Yes, exactly. Well, there’s a difference between freedom of worship and freedom of religion. Worship is an event that happens inside a house of worship. Uh, religion is a lifestyle. It is a way of living. It is what I base my decisions on at home, at work, and everything else. It’s where it colors everything in my life; the way I educate my kids, the way I do my ethics at work, the way I treat my neighbor. The—the Constitution does not guarantee freedom of worship—it guarantees freedom of religion. And this is what I call America’s first freedom; because the first phrase of the first sentence of the First Amendment is: “Congress shall make no law concerning, you know, ah, ah, im—imposition on religion.” In other words, freedom of—of religion. America was founded by religious people; devout people who came here because they wanted freedom of religion, It’s what made America different from every other country. Warren: And so it is our first freedom. It comes before the freedom of speech, it comes before the freedom of the press, it comes before freedom to assembly, it comes before the right to bear arms. Why; because none of these other freedoms matter if you don’t have the freedom to believe and to practice your belief. Arroyo: Where do you think the Supreme Courts going to go on this? Warren: I’m going to be there protesting. I don’t have a problem with pork; but I’m gonna protest that. If they make a law that says, uh, “Every Catholic, uh, school has to provide contraceptives”—if you’re morally convinced you shouldn’t have contraceptives—I stand with you, firm with you, on your belief on that, because you have a right to change your chil—train your children the way you want to. Warren: The Academy for Life, exactly. Arroyo: Tell me what they discovered, and why did they come? This was a—this was a sizable group. Warren: It was. There were about 30 Bishops from Europe. Um, one of the men who had been, ah, actually trained and mentored by Jean Vanier. Warren: Which is an interesting thing because we have a Retreat Center here and my spiritual director, uh who grew up at Saddleback, actually, ah, went and trained under Jean Vanier, too. Warren: And—and they need a—a new fresh, uh, relationship to our Savior. Warren: (Laughs) Yes, that’s right. Arroyo: To really a new life. Warren: Yeah, it exactly is. Arroyo: Tell me about that, and, how baptisms led you to this point. Warren: So I said, “I need to lose about 90 pounds.” You could have heard the sucking of the air out of th—the congregation that day. And I said, “Does anybody want to join me on this?” Now, I figured maybe 200 people would sign up. 12,000 signed up that day. Arroyo: Is really the support. Warren: Lost twice as much mate—weight—those who were in a group, that those who did it on their own. Warren: There’s the power of community. Warren: Because I happen to like—well, you know what; because you have more—more, uh, uh, uh, shows that relate to history. Warren: Ah, thank you Mother Angelica. Warren: Yeah, yeah. I’m not much into bling. Arroyo: Why those three? What do they give you? And what have they given you? Warren: Well, th—th—the only one thing—the only that was missing was Pope John Paul II. Those four people, were the greatest influences on the 20th century; without a doubt. Warren: That says, ah, “Be holy for God is holy and He loves you.” And, Mother Theresa, uh, taught the world that the face of Jesus is seen in the poor; that we need the poor. Not—not only do the poor need us, we,need, the poor. And God has chosen, ah—”does God have favorites?” Yes, He does. He loves the poor. There are over 2,000 verses on the poor in the Bible and, uh, God ca-uh—God says, “You care about the poor; I’ll care about you, and your—your needs.” So, Mother Theresa taught that. Billy Graham was one of my nine mentors. Ah, all of my mentors have now passed on to heaven except Billy—he’s 95, I went to his 95th birthday, Billy Graham taught me how to be a Christian statesman. He taught me how to relate to people of different faiths; relate to world leaders, and, ah, he also taught me about how to maintain moral integrity. And the Billy Graham Association created a list of things that they said, “We will not do.” And I copied that and expanded it, 33 years ago, and everybody on my staff signs it. Martin Luther King, uh, Mother Theresa, Billy Graham, each teach humility, integrity, generosity. They teach, ah, ah, values; and being willing to—to, uh, to suffer for your faith. Arroyo: Is there a weight of—of having that moniker attached to what you do day in and day out? Arroyo: (Laughing) You found it. Arroyo: (simultaneously with Warren) Not about you, yeah. Warren: The forward march. It’s, not, about, you. And really that’s like a slap in the face in the “me” generation where everything our culture says is, “It’s all about you.” Okay, it’s all about me; how I look, how I feel, what I want to do, it’s my life, it’s my body, ah, it’s my, you know, money. And when I say, “It’s not about you,” it’s really about the most counter culture thing you could say. What I didn’t know (long pause) was how often I was gonna be tested on that—on that statement once I said it. Warren: It’s not about you. And, I often have to say that phrase eight or nine times a day. Warren: When I’m criticized, unfairly; it’s not about you. When I’m praised, I say, “It’s not about you.” When people misunderstand me—it’s not about you. When people, ah, challenge me, or question, my motivation—it’s not about you. And I have to say that I had no idea how many times God was gonna test me on that the rest of my life. 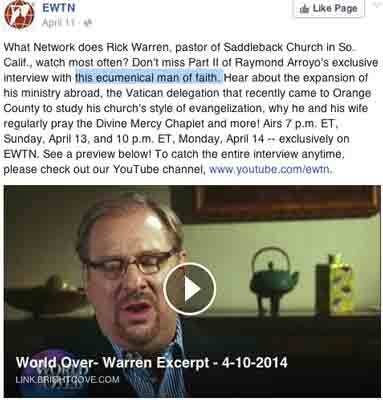 Arroyo: Thank you, Rick Warren. Warren: Thank you, Ray; and God bless all, ah, EWT, ah, viewers and, thank you Mother Angelica for having a vision. Ah, a spry little woman who said, “It can be done” when everybody said, “It couldn’t be done.” A—a tower of faith. Arroyo: I agree. Thank you.